Kathleen Wilson is currently an active master swim instructor at the Medical University of South Carolina’s Wellness Center, a city of Charleston councilmember serving District 12, James Island and a professional harpist serving several local orchestras. She is best known as a marathon open water swimmer, having completed many of the world’s greatest swims, becoming the first SC resident to swim the English Channel. Kathleen has taught private and group traditional swimming lessons as well as assisted with area swim teams as a coach. 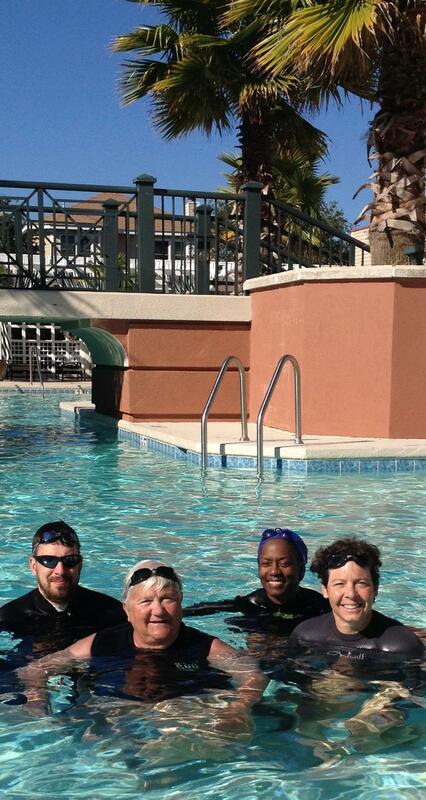 Additionally, she trains and mentors swimmers seeking conditioning and knowledge of open water and marathon swimming. She continues to train daily as a swimmer preparing for additional swims around the world and after performing at a very high level as an athlete, Kathleen is extremely motivated to assist those who have never experienced the joy of comfort in the water and serving the most vulnerable among us- those who cannot swim due to fear of the water. Through her own experiences in marathon swimming, she understands the mindset of fear and how to work through it as well as the properties of water, often misunderstood by fearful adults.